Just Fork It: It's really easy being green... when you're my Collard Greens! It's really easy being green... when you're my Collard Greens! I've been feeling nostalgic for Southern holiday food the last few years, and have been recreating the recipes I loved when I lived in Georgia. 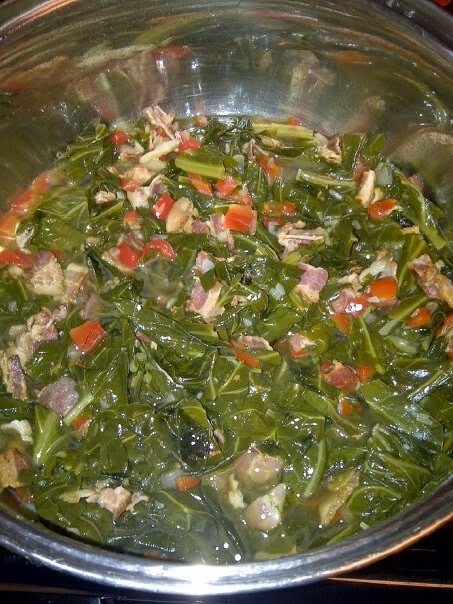 I didn't appreciate collard greens then, but have grown to love Love LOVE them now! I had to search for recipes to base my own on, since most use a ham bone, ham hock (!) or fat back (!! ), none of which are easily found by me way up here in the Great White North. It works and it tastes phenomenal, and it's smoky and salty and meaty and easy, and I don't have a bone to deal with. 1 small onion (of any kind). Cut up the bacon into small pieces, and start that frying in the pot. I put in a little water to help it render w/out burning. Chop the onion nto medium sized pieces and put that in next, then the red bell pepper. Just get them sweating a bit, get the rawness out. While that is going on, prepare the greens. Clean the greens, and cut the stems off. You can cut the really thick stem out of the leaves, but you don't have to go nuts. I've left some of the in-leaf-stem on, and it got plenty soft enough to eat. I like to cut the leaves in 1/2 length wise, then in 3 or 4 sections along the length (I stack them and cut a bunch at once). Again, a bit of stem doesn't seem to hurt anything. Plop that in, and pour in the chicken stock and water. You can add more water if you think you need it, but the greens don't need to be covered in water (they will melt down). Cover. Bring to boil, then reduce to way low simmer. At least till greens are soft to your liking (let's say an hour), or let them sit there all day while you do other stuff. Only salt at the end, but you can add chili flakes if you like, up front. Go easy, the heat builds. The leaves get darker as it cooks longer... this batch still needs to go for a bit.